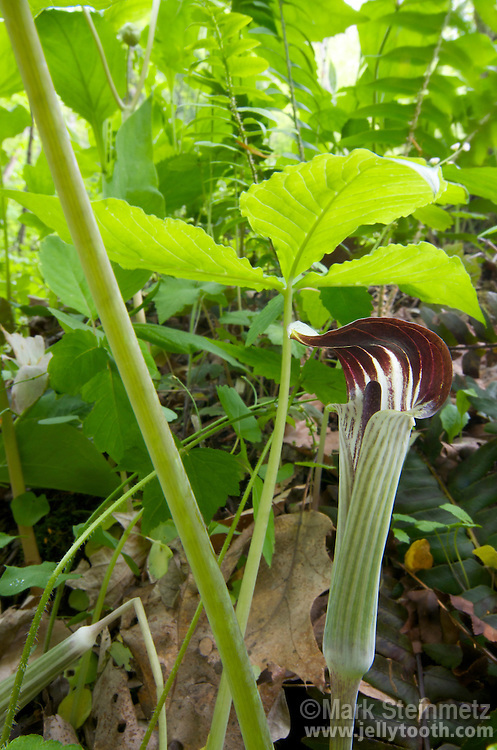 Jack-in-the-pulpit (Arisaema triphyllum) flower, and underneath of trifoliate compound leaf (of an adjacent plant). Inflorescence is a club-shaped spadix with flowers at the base and a slender tip ("Jack"), surrounded by a flanged spathe that extends overtop ("the pulpit"). Dioecious. Blooms in the spring in rich, moist woods. Native to eastern North America. Also known as Indian Turnip, as the root is edible when cooked and was a food item of Native Americans. Mohican State Forest, Ohio, USA.